The best part of the building is the dome at the top. Right now it's a private conference room and showroom for architect Helmut Jahn (he designed that awesome terminal at O'hare with the moving lights sculpture), but it used to be a restaurant called the Stratosphere Lounge. Aside from being very fancy, it was a Prohibition-era speakeasy operated by Al Capone. Movies love this building. It's the Gotham City Courthouse in "Batman Begins," and in one scene Batman sits on one of the turrets. I haven't seen it yet, but in "Transformers: Dark of the Moon" there's a giant robot battle on top of the building. Since this was originally a jeweler's building, it had many different security features. One of them was a really extreme version of a parking garage. Since jewelers would carry their merchandise around with them, they were often in danger of being mugged. So, to make sure no one was attacked on the walk between the car and the office, jeweler's just drove their car straight into the building! A car elevator would bring you to the floor you worked on and then drop your car off on one of the parking levels. 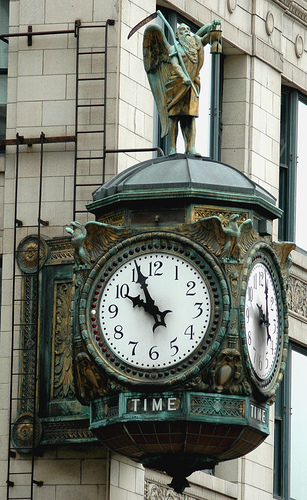 If you visit the northeast corner of the building there's a clock that at first glance looks a little like the Marshall Field's clock. That is, until you notice a creepy guy on top that looks like death but is really supposed to be Father Time. At night the clock is outlined in dark red lights, which makes it look even creepier. 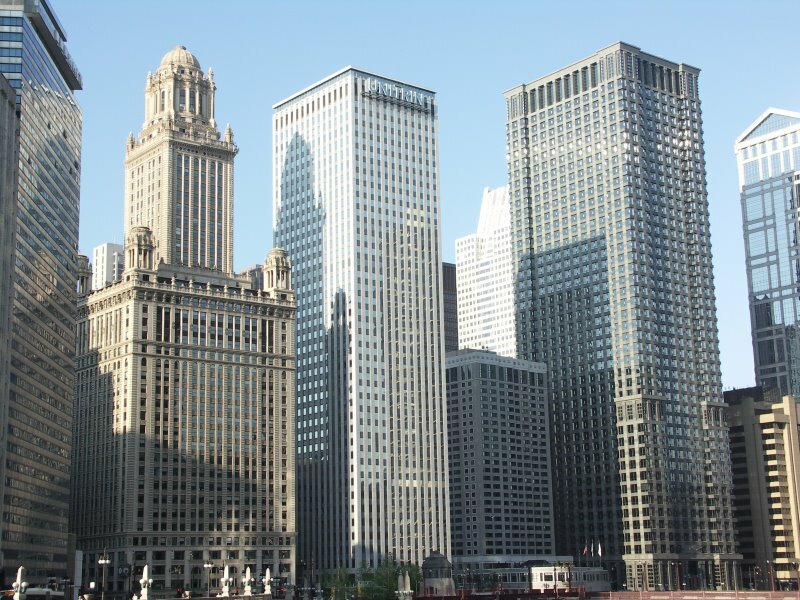 What's your favorite Chicago building?